Nothing in New Jersey has ever come easy. Surviving in a seasonal town, dealing with extreme weather, and supporting those around you can be tough. We do it because we love it. We're also inspired by those who came before us. And as we open the doors of Mud City for our 20th season, we're looking back at those who paved the way for our coastal communities. From the 1870s through the 1950s, pound fishing was central to the economy of the coast and all of New Jersey. It had originally been used by Native Americans in bays and more protected waterways. Eventually, pound fishing was done in the ocean when European immigrants took it to the next level. According to the New Jersey Courier, at one point there were 128 pound-fishing operations in New Jersey, employing some 605 fishermen. The technique involved men driving hickory poles into the ocean floor, about a half mile off the beach. They would lace them with nets, forming fish traps or “pounds.” An over 1,000-foot stretch of net called the “wier” was built perpendicular to the shoreline. Fish swimming along the coast would encounter the nets and swim east, into the pounds were they were essentially trapped. Generally, the pounds were set in March and fished through November, but occasionally the season went into the winter. 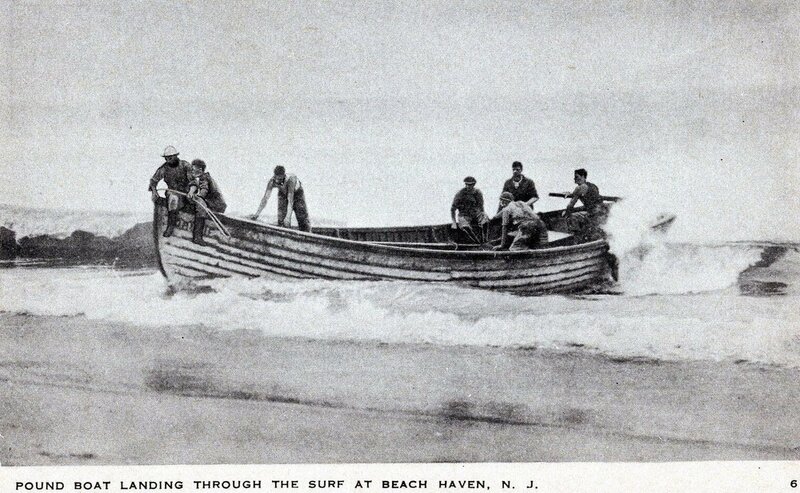 In the early days, these hardy seafaring gents would row out to the pound and row back through the surf. Once they hit the beach, the skiffs were pulled by Clydesdales. They would unload the fish and pack them in ice stored from the previous winter – cut from local freshwater sources and insulated. The fish were sorted into hand-woven baskets. The occasional bigger fish was a windfall. During the summer, a good haul would always attract a crowd of onlookers. After the 1930s, the pound fishermen used outboard engines and tractors to move the boats. From there, the fish was shipped, usually by rail to the Dock Street Market in Philly, North Jersey, and South Street Seaport in NYC. Long Beach Island was home to seven pound operations – Long Beach Fishery, Crest Fishery, Barnegat City Fishery, Surf City Fish Company, St. Alban’s Fish Co., Ship Bottom Fishery, and Beach Haven Fishery. The pound fisheries produced dozens of species of fish. Among them were many we still serve today like cod, flounder, tuna, squid, monk. and weakfish. They’d also net bluefish, striped bass, croakers, congor eels, whiting, herring, kingfish and sea trout, even flying fish and sun fish. The New Jersey Maritime Museum, across the street from Parker’s Garage, is a treasure trove of information, photos and displays focusing on our coastal heritage. They also have fascinating displays of how pound fishing worked. Deb Whitcraft, our local curator and historian, says pound fishing “played a monumental role,” in the Island’s history. Mud City celebrates the rich seafaring history on Long Beach Island and the mainland. For as much as we appreciate the old traditions of sailing the bay, the grand hotels, and other summertime tourism draws, we have a deep respect for the hardworking men and women who put us on the map, working the bay and ocean.